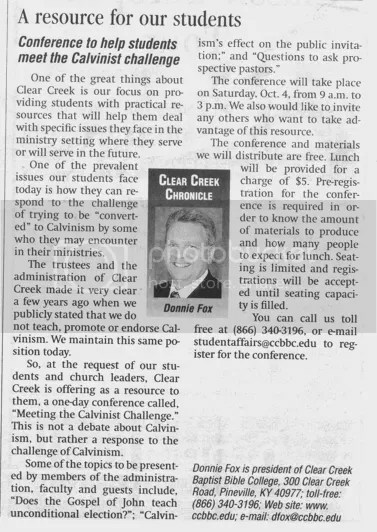 The trustees and administration of Clear Creek made it very clear a few years ago when we publicly stated that we do not teach, promote or endorse Calvinism. We maintain this same position today. This kind of candor is commendable. While I could wish that Clear Creek would be more open to the theology on which the Southern Baptist Convention was founded, it is certainly the prerogative of the trustees and administration and Kentucky Baptists not to be. Call it the return of theology to the SBC. Whatever your attitude about the actual theological points involved there is no escaping the fact that Calvinism is a conversation that the Southern Baptist Convention is going to have. And it will be best addressed in formats initiated by last year’s Building Bridges Conference, where the issues are clearly stated and positions are heartily yet respectfully argued. Does Calvinism present a challenge? Without a doubt it does. If it is true, then we must acknowledge that much that is being taught in our churches today is false. If it is false, then we must acknowledge that those who believe and teach the biblical doctrines historically delineated by that nickname are misled and misleading others. We cannot have it both ways. I believe that this coming conversation has great potential good as well as for evil. By that I do not mean that it will be good if “our side wins” and “there side looses.” What I mean is this: if the kind of thinking that views this dialogue as a “win-lose” proposition and that wants to choose up sides prevails then much evil can erupt from it. If the 63% that are “concerned” decide that they need to declare war on the growing numbers that embrace the doctrines of grace, or if those in the growing minority decide to lock and load on the ones who are concerned, then we can expect an ugly and largely fruitless bloodbath. If, on the other hand, cooler heads prevail and this issue can be viewed as an intramural debate amongst brothers who are willing to show love and respect to those with whom they disagree, then much good can come from it. This is my prayer. And it is how I want to conduct myself. Don’t misunderstand me. I am NOT suggesting that anyone back off his or her convictions. What I am suggesting is that Southern Baptists grow up and learn how to be ruthlessly biblical in arguing for positions that we believe are derived from the written Word o God and to do so in love and gentleness. Ours is a day that seems to think that solid convictions and genuine humility are mutually exclusive. But truth and love are not opposite choices. Truth requires love and love always rejoices in the truth. So, let the conversation begin…or in some cases, let it continue. Join it. Don’t be shy about it. Nail your theological colors to the mast and speak plainly about your beliefs. And do it without rancor or animosity, but in joy and hope that as we press each other to examine God’s Word more carefully, the Lord may well be pleased to give us all greater insight into the truth He has entrusted to us.